Oven Baked Zucchini Fries – An amazing lightened up appetizer or side dish that will be on the table in less than 30 minutes! By now you know I loved oven-frying. I’m a sucker for those fried flavors but there are three reasons I have never deep-fried in my kitchen. One: dipping my food in quarts of oil can gross me out a little. I do eat fried foods from time to time when I go out to eat but, I guess it’s one of those out of sight out of mind things. 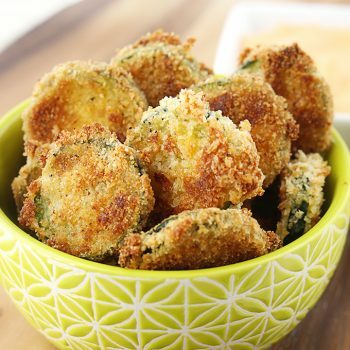 Two: I can make really crispy oven-fried versions of my favorite indulgences without so much of the un-healthy cons that come with deep frying. Soooo no brainer, right? And three: I don’t like to smell like fried food. I worked in a restaurant all through high school and I came home smelling like oil and fried food every. single. night. Just can’t do it anymore, just thinking about the smell makes me queasy. These Oven Baked Zucchini Fries are SOOOO good. Don’t you dare get scared off because they are zucchini. They are juice and delicious, and when they get crisped up in a really hot oven, you’ll be surprised just how indulgent they are – and shocked that they’re pretty dang healthy! Plus, you won’t be able to get enough of that spicy dipping sauce (only 3 ingredients!)! 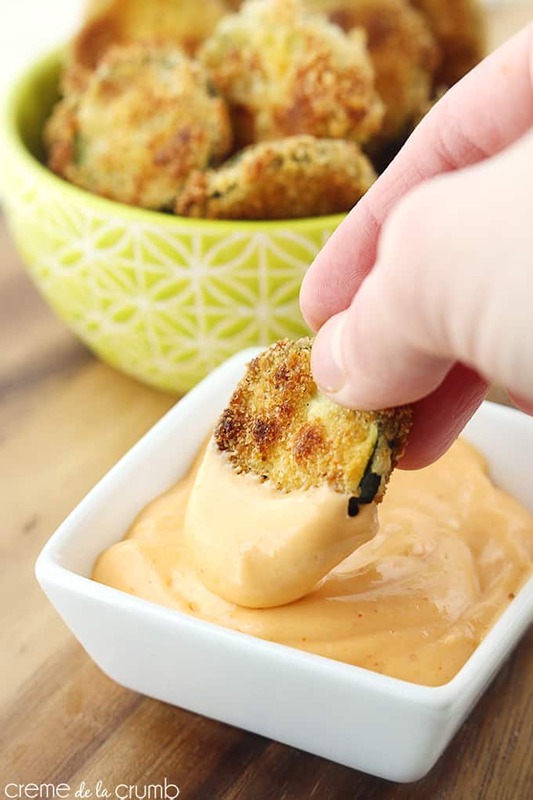 Crispy oven-baked zucchini fries with a spicy dipping sauce! A lightened up appetizer or side dish that will be on the table in less than 30 minutes! Preheat oven to 450. Line a baking sheet with nonstick foil and spray heavily with cooking spray. Place flour and sliced zucchinis in a large plastic bag, seal and toss to coat the zucchini. Place panko crumbs in one small bowl and whisked eggs in another bowl. Combine salt, black pepper, garlic powder and chili powder in a third bowl and whisk to mix well. 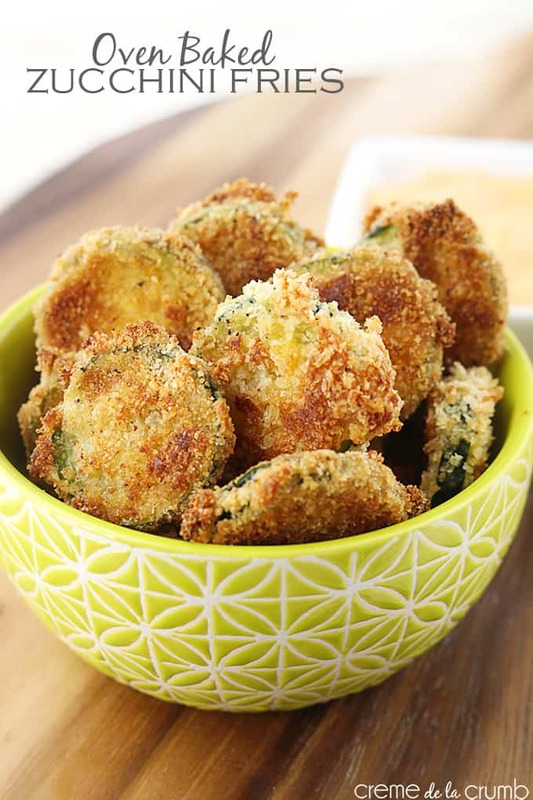 Dip flour-coated zucchini slices in the whisked eggs, then toss them in the panko crumbs. Dip them a second time in the egg and a a second time in the panko. Place all zucchini slices on prepared baking sheet in a single layer. Sprinkle half of the seasoning mixture over the zucchini slices and spray with cooking spray. Bake about 5-6 minutes until tops of zucchini fries begin to brown. Remove from oven, carefully flip over all of the zucchini slices, sprinkle with remaining seasoning and return to oven. Cook another 4-5 minutes until browned. Remove and allow to cool slightly. Mix together mayo, sriracha, and garlic powder until smooth. Serve with zucchini fries. Enjoy! More baked instead of fried recipes to try! Those zucchini fries are fantastic! I think I’m in love! I love zucchini and with spring and summer approaching these will have to be adding into our dinner and snack rotation! And spicy dipping sauce…yes please! These look yummy! I have to know…where did you get that gorgeous lime green bowl? I’d love to give these a try – any “prep-ahead” options? The egg and panko was only enough to cover half of the zucchini. It was tasty but the proportions were way off. It would be nice if you could give the carb count on your receipes also protein and fat. But if you can’t give all, carbs would be great as I am on Keto diet.